Corn Bunting (Miliaria calandra). Taken at Blewbury Down, Oxon., on December 22nd 2018. Taken at Blewbury Down, Oxon., on December 22nd 2018. Unlike most buntings, the Corn Bunting sexes are similar, although the male is larger. They are streaked grey-brown above, and have whitish underparts. 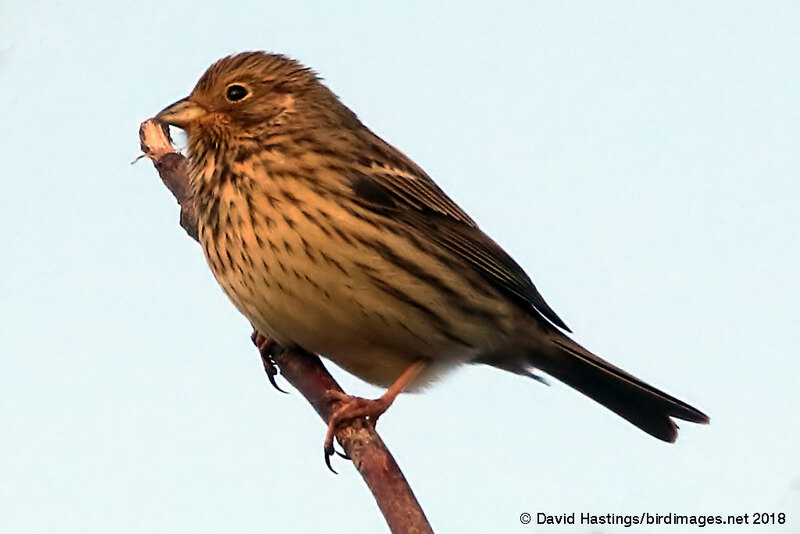 Corn Buntings are found mainly in England and the east coast of Scotland. The Corn Bunting is a bird of open country with trees, such as farmland and weedy wasteland. It has declined greatly in northwest Europe due to intensive agricultural practices depriving it of its food supply of weed seeds and insects, the latter especially when feeding young. They are often seen perched prominently on a hedge, post or wire, singing a jangling song. Birds form flocks in the winter. The Corn Bunting has Red status on the British list due to its dramatic population decline caused by changes in farming practices. There are about 11000 breeding territories in the UK.